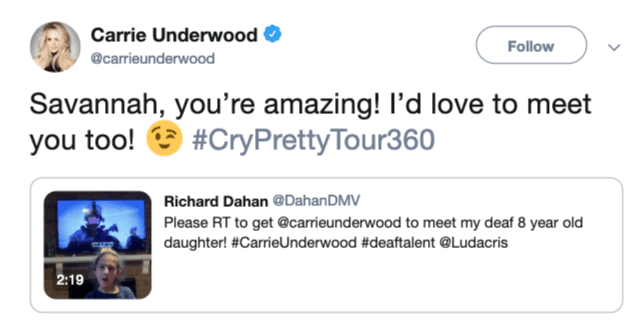 8-year-old Savannah Dahan is a FAN of Carrie Underwood! A video of the deaf 8-year-old signing Carries’s “The Champion” went viral. Savannah’s dad recorded her and uploaded the video to YouTube. Savannah used ASL to sing Carrie’s song with a whole lot of passion. “She asked us to record her because she likes to see herself perform. She first memorizes the lyrics and then learns to match the beats with those lyrics, that is how she is able to follow the song,” says Savannah’s dad.